Ogden on Politics: Will Unrealistic Expectations of Huge Romney Win in New Hampshire Turn a Victory Into a Defeat? Will Unrealistic Expectations of Huge Romney Win in New Hampshire Turn a Victory Into a Defeat? By all accounts, former Massachusetts Governor Matt Romney should win next week's New Hampshire primary easily. Two polls released today show that Mitt Romney comfortably leading the Granite State. What is unfortunate for Romney is that expectations have been so built up about his performance in New Hampshire that he is unlikely to match those expectations. 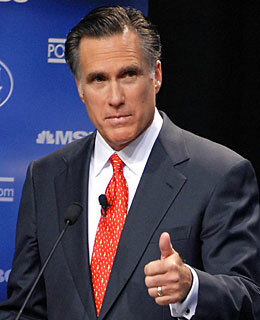 The NonRomneys are beginning to attack Romney and it is likely his numbers are going to suffer as a result. The media though gauges winners and losers by performance versus expectations. If Romney barely breaks 30% next week, which I think is quite possible,l it might be viewed as a setback instead of as a win. Even if Romney meets expectations, he probably won't obtain half of the votes even when he is nearly the home team. Republican voters are incredibly fragmented and one wonders if the party will finally run aground after years of preaching small government and practicing large. I had a wake-up moment yesterday while talking by phone to a clerk who is a potential Republican voter in New Hampshire, who said that he was impressed with Romney because of things he said, in an advertisement. I answered that lies were often told in those, that Romney made his fortune selling hedge funds, and there was evidence of fakery in those dealings of his, and that Ron Paul was very honest, and I hoped that he would vote for him. He then asked me if Paul was the short candidate. That shallow remark reminded me that predictably, the taller of two candidates, narrowed down, in a presidential race, gets the most votes. A San Francisco newspaper commentator wrote that he was told that Paul is staying in the race in an effort to influence the Republican platform at the national convention. Sheesh. It's good to see Republicans falling in line behind Romney. Ron Paul is a loon. Mitt has won Iowa. He will win NH. Then he will win SC and then FLA. At that point, it will be over, and the GOP can get on about the task of uniting behind the Mittster, raise tons of money, organize, and oust Obama from the WH. I can tell you the tea party at large is all across the board. @ Marycatherine, you are correct, Paul has plenty of money and tons of followers (I'm not one) and you will see him at the convention, because it's all about delegates and he will have some, and I don't think the trading floor will be open.